The Rafters bar complex on Northland Road. Police investigating a report of criminal damage at a bar complex in Derry have arrested two teenagers at the scene. 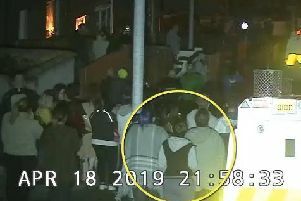 PSNI Sergeant Gavin McLaughlin said police received a report from a member of the public who noticed two males outside the restaurant/bar premises on Northland Road at 11:35pm on Monday night. It is understood the incident involved the Rafters premises. Sergeant McLaughlin said the witness told police a window of the premises had been smashed and damage had been caused to a gas box situated close to the building. “Police attended and located two teenagers, aged 15 and 19, inside the building. They were arrested on suspicion of offences, including burglary with intent to steal and criminal damage, and are currently in custody assisting police with their enquiries. “I want to thank the member of public who made the report to police, and I would appeal to anyone who was in the area last night and noticed any suspicious behaviour, or anyone who knows anything about this incident to contact police at Strand Road on the non emergency number 101, quoting reference number 1691 of 28/05/18.